If you support the Shock-Free Coalition then you may use, cross post or link to your own website any of the articles, graphics and documents you find on this site. If you would like to place a text version of the pledge on your website then it must be done under these specific conditions. 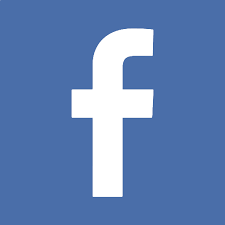 You may post the text as below, in exactly the same format. The text cannot be edited or modified in any way. 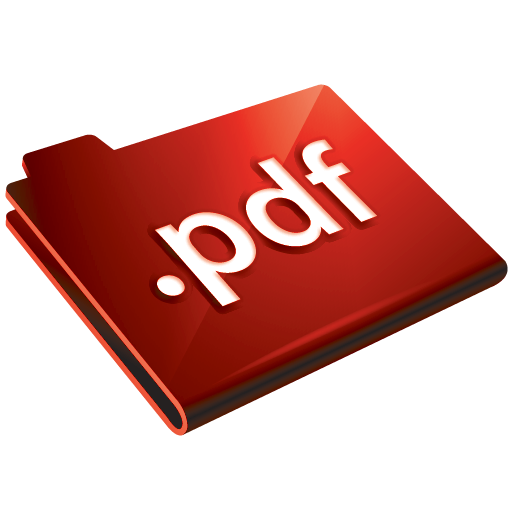 You must have a link to the PDF Pledge Document. There must be a link to download the PDF Pledge on the same page the pledge text is posted. You must provide a link to the sign the pledge page on this site. There link must be obvious and prominent. You must display the four pledge graphics as seen below or to the left here . The four pledge graphics must be used on the same page and displayed nicely by or around the pledge text. You must display the Shock-Free Coalition Logo The text must be accompanied by the Shock-Free Coalition Logo that is linked to www.shockfree.org. You may also display the Shock-Free badge to accompany the logo and text. 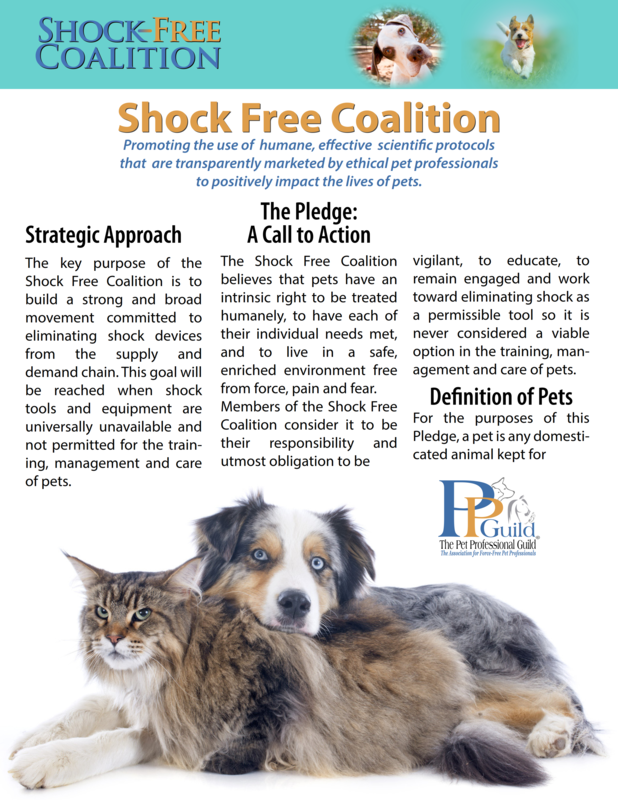 The key purpose of the Shock Free Coalition is to build a strong and broad movement committed to eliminating shock devices from the supply and demand chain. 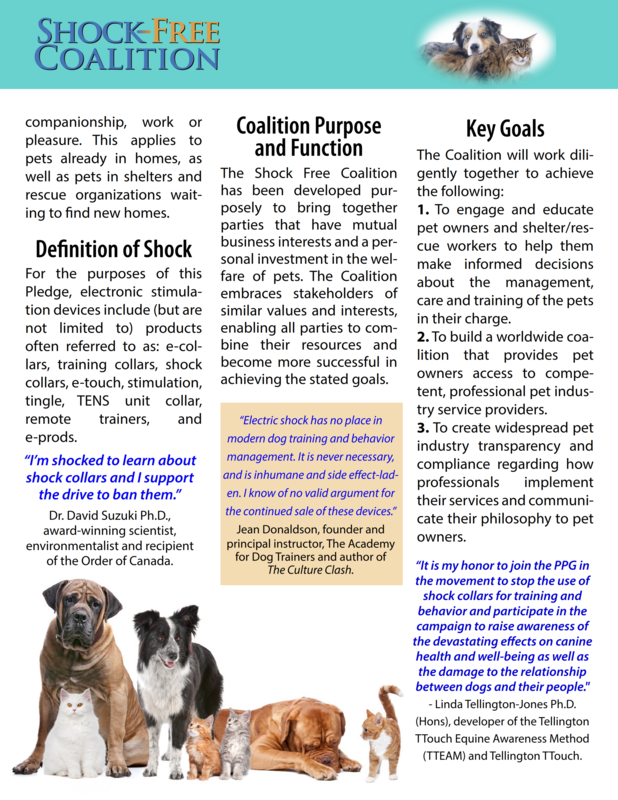 This goal will be reached when shock tools and equipment are universally unavailable and not permitted for the training, management and care of pets. 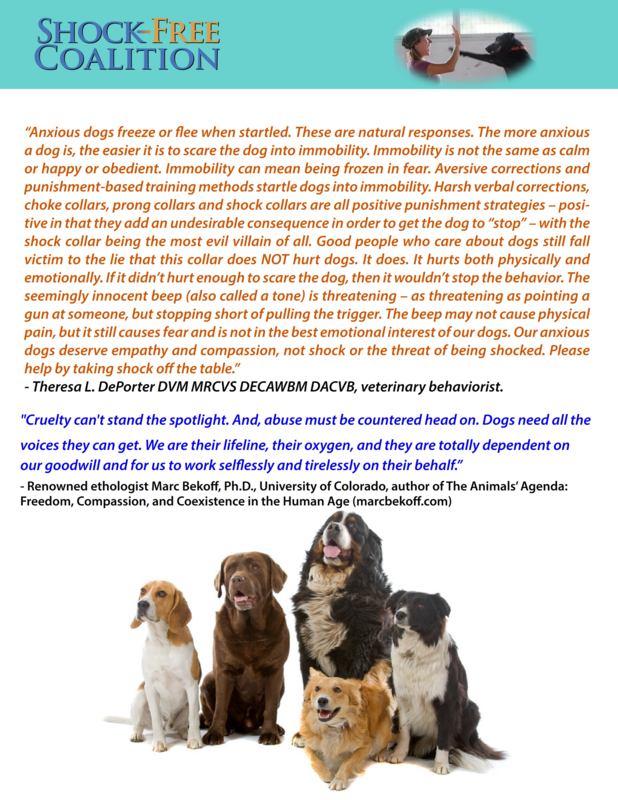 The Shock Free Coalition believes that pets have an intrinsic right to be treated humanely, to have each of their individual needs met, and to live in a safe, enriched environment free from force, pain and fear. 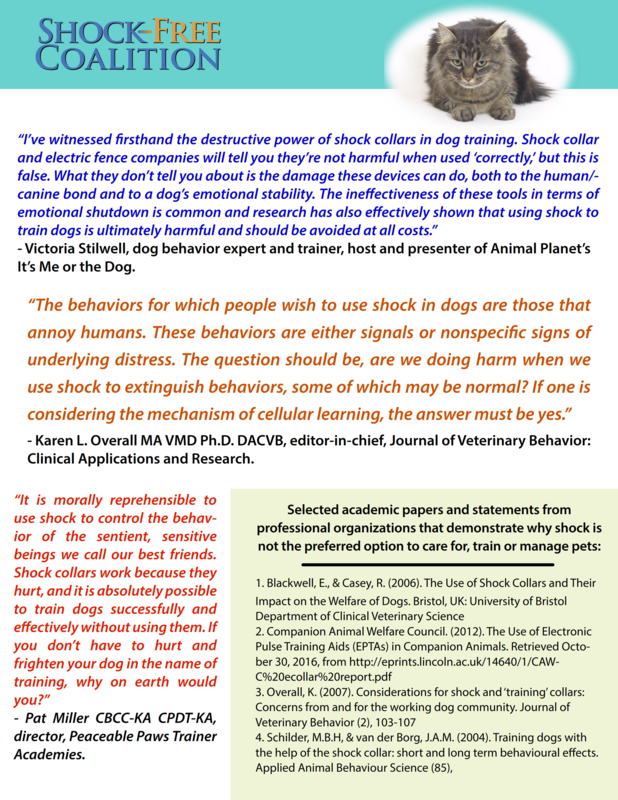 Members of the Shock Free Coalition consider it to be their responsibility and utmost obligation to be vigilant, to educate, to remain engaged and work toward eliminating shock as a permissible tool so it is never considered a viable option in the training, management and care of pets. Sign the pledge click here. 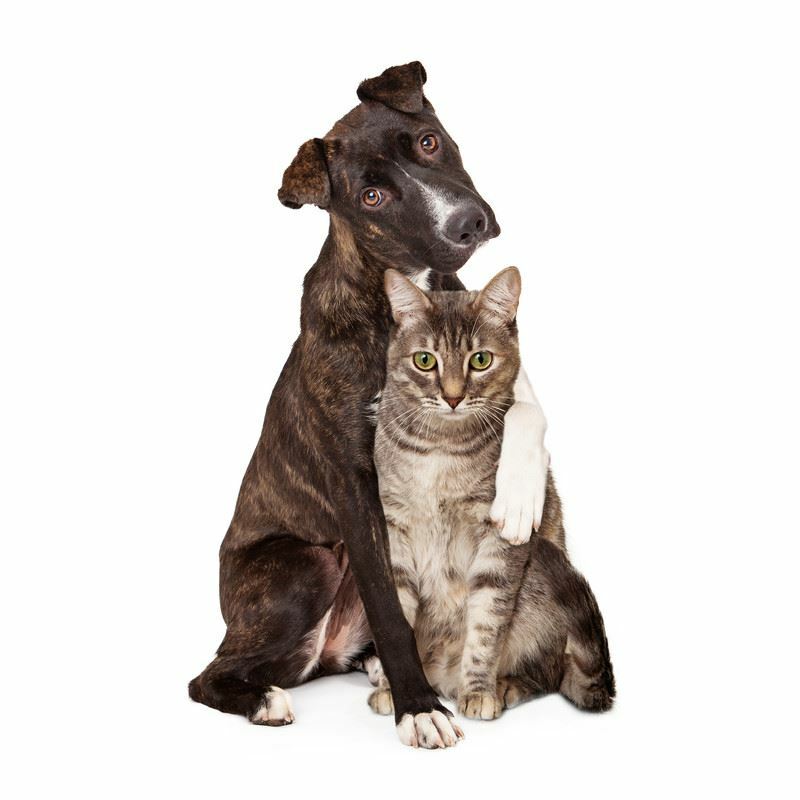 The Shock Free Coalition has been developed purposely to bring together parties that have mutual business interests and a personal investment in the welfare of pets. 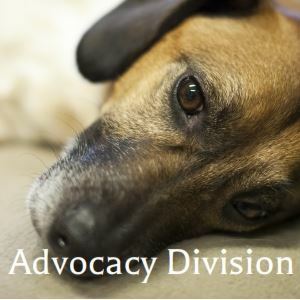 The Coalition embraces stakeholders of similar values and interests, enabling all parties to combine their resources and become more successful in achieving the stated goals.